It has now been 24 days since I underwent shoulder surgery for a torn rotator cuff, torn bicep tendon, and torn labrum. It has been three+ weeks of very little sleep, quite a bit of pain, and just plain going nuts not being able to do much including typing. I am dictating this post and hoping for no embarrassing typos from the speech to text converter. I’ve now gotten my stitches out and bandages off. Fortunately I’m off the OxyContin and hopefully my digestive system will resume normal operation soon, as a result, if you know what I mean. I had my first physical therapy session a couple of days ago. That was the first time in weeks I’ve had the opportunity to move my arm in any direction. There are a few directions which are extremely painful and difficult to move, like reaching forward. I can barely move my arm an inch or two forward at this point. There are a couple of other directions which are better. 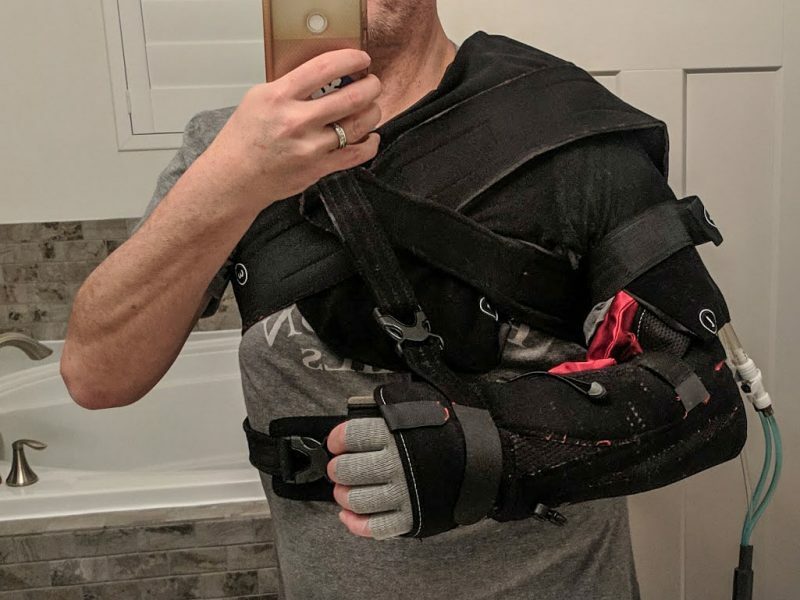 I’m now past the halfway point in terms of wearing a sling, which in total is six weeks. I’m greatly looking forward to losing the sling. Having one arm not usable makes things like driving, eating, showering, getting dressed, tying your shoes, sleeping, very difficult. Yes, I have to sleep in the sling. Perhaps I’ll publish the full list of irritating things to do one-handed later. Once the sling is off I won’t necessarily be able to do a lot with my arm, however. But that will be a big deal in terms of steps in the process of getting better. Right now August or Septembers look to be when I’ll be able to start attempting to make golf swings again. At that point I don’t expect to have much in terms of power or flexibility, so I’ll be keeping my expectations low. I should be able to putt long before that and perhaps chip and work on short game shortly after that. Putting has never been an issue but my short game has been pretty bad the last few years. Perhaps one positive which will come out of this is a better short game, but I fear my long game may be forever gone. I’m going to miss playing competitive amateur golf this season. Even if that’s just the $2 Nassau against my Wednesday buddies. I will not renew my local golf Association membership because there’ll be no point in tracking handicap if I’m not playing. I really like to compete In tournaments but I don’t do that a lot of due to sandbaggers, or as I like to call them cheaters. Still I’ll miss that adrenaline rush and the challenge of trying to keep myself composed under pressure in tournament situations. Though I won’t be able to do much club testing for a while I will still strive to produce many great golf reviews and product features I can. I can certainly still review golf travel, golf resorts, golf apparel, golf accessories and so on, without having to swing a club. Always good to go on golf satire and humor.